These adhesive paper tapes are really versatile and, being made from paper, they can be cut or torn from the roll. The paper tape has a low tack and in some instances can be attached and then peeled off again. 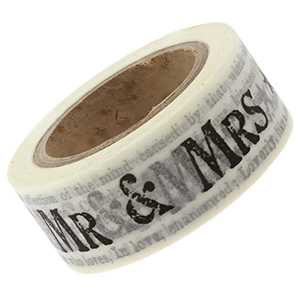 The tape can be used for wrapping gifts, card making, scrapbooking and for decorating almost anything. We’ve chosen a variety of 'wedding related' phrases - so jazz up your wedding presents, gifts and cards, it will add that 'little extra' wherever you choose to use it! 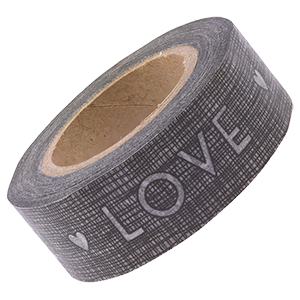 We have a lovely selection of pretty wedding themed decorative tapes for you to use when gift wrapping or for use on your DIY wedding stationery. With a lovely retro style they have a charm all of their own. If you like these pretty tapes why not look at our whole collection of glitter and Washi tapes.